Raptor Safety Cuff Leather Palm Gloves are heavy duty work gloves that never take a break. These industrial gloves have an extra durable cuff for enhanced protection and usability, and are recommended for activities such as construction, landscaping, metalworking, mining, and sanitation. Available in bulk pack, medium weight. Raptor Safety Cuff Leather Palm Gloves are packaged 10 packs of 12 per case. Call About Our Container and Private Label Programs! © 1999-2019 Pro-Stat, Inc. All Rights Reserved. We are Emerald Professional Protection Products, a major importer and wholesaler of vinyl, nitrile and latex gloves, infection control items, and single-use disposables. Our customers are spread across many industries, including the janitorial, automotive, medical, dental, veterinary, food service and safety supply markets. 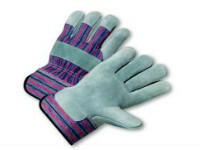 We offer the widest disposable glove selection at low prices. Stay protected and save money. Make your protection our business.